We believe that exposure to piano is very important to a child's understanding of musical basics. Even if your child moves on to another instrument, or already has begun another instrument, you will have provided an essential foundation. The non-accelerated class is for the young beginner ages 4-6. Students work from a lesson and writing book, and along with learning to play the piano, complete writing and ear training exercises. 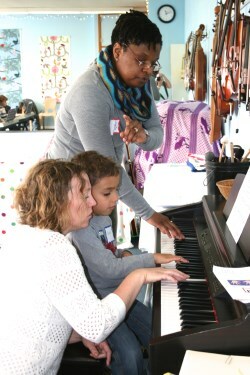 The class also incorporates a CD accompaniment, which students enjoy, and can sing and play along with as they listen. Reading skills are not imperative as concepts are presented visually using color-coding and symbols. The class consists of eleven thirty-minute sessions in the fall and thirteen thirty-minute sessions in the spring. The accelerated class is for the older beginner ages 6-8 with more developed motor skills such as hand-eye coordination. The ability to read at a first or second grade level and understand simple instructions in the method book is necessary. Students also work from a lesson and theory book as well as complete written and ear training exercises. More concepts are presented each week than in the non-accelerated class. The class consists of eleven thirty-minute sessions in the fall and thirteen thirty-minute sessions in the spring. We provide keyboards and a piano in class. 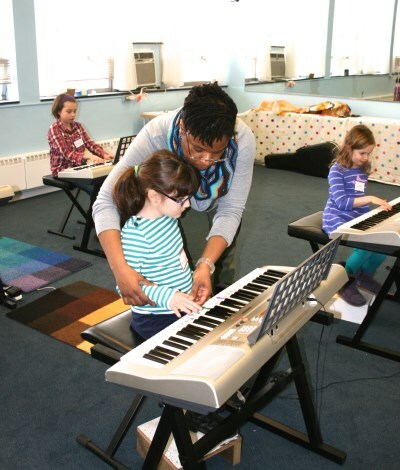 We ask that you provide access to a piano or keyboard during the week.